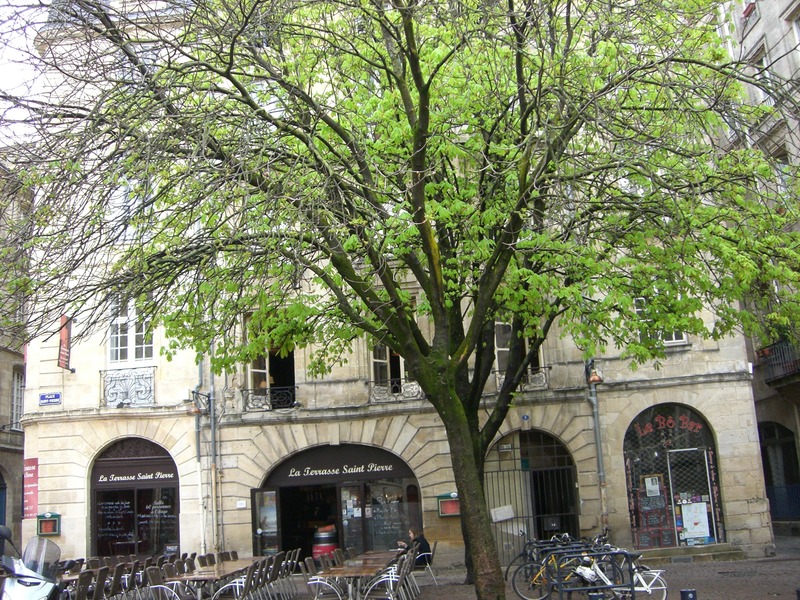 Bordeaux is the ideal-sized city to just wander around. In this sense, it is a bite-sized city that still offers enough funky and charming little neighborhoods to give you the feeling that you are exploring. 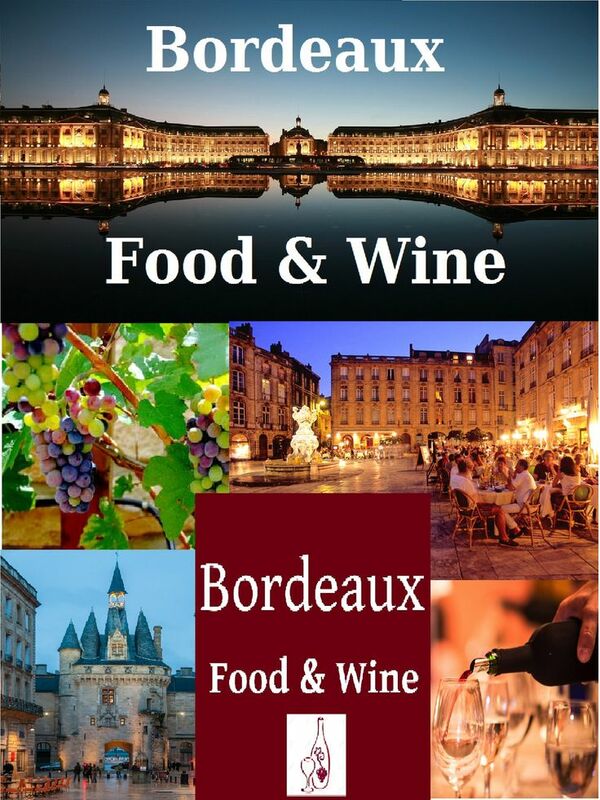 Chartrons is the traditional wine district of Bordeaux where, during the city’s height of its centuries of wine trade with England, the wines were warehoused before being shipped out via La Garonne. 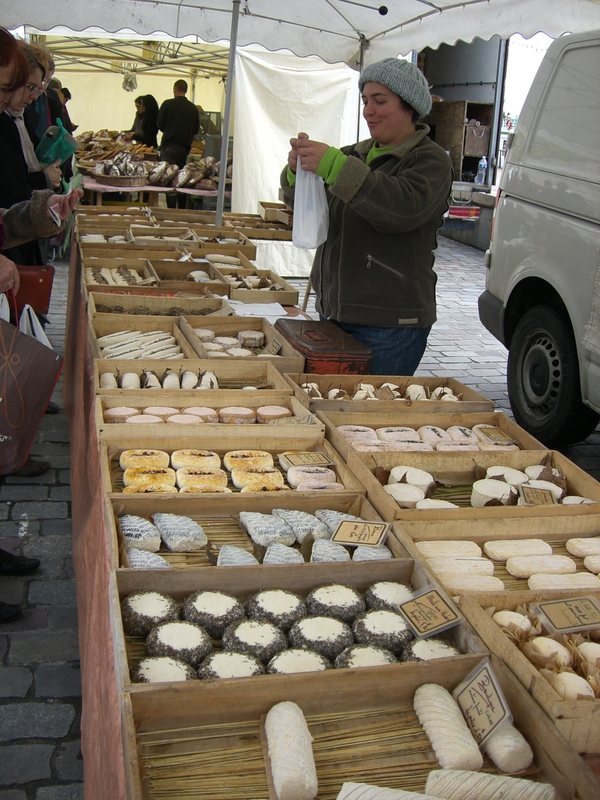 Chartrons is now a charming district known for its many antique shops, lovely cafes’ and trendy boutiques. Soon, it will sport a pedestrian zone as well. Central now to the Chartrons District is the Chartrons Market Square and the covered market. About a 5-minute walk from the city’s expansive gardens, if you turn off the main street and wind your way along smaller, norrower ones, you will stumble onto this covered Chartrons Market made of stone, iron and glass and restored in 1998 from its 19th c. original building. Its walls are flanked with outdoor chairs and tables to enjoy afternoon and evening drinks and its perimeter is surrounded by delightful choices of Salon de Thes and lunch restaurants, many of which serve dinner as well. 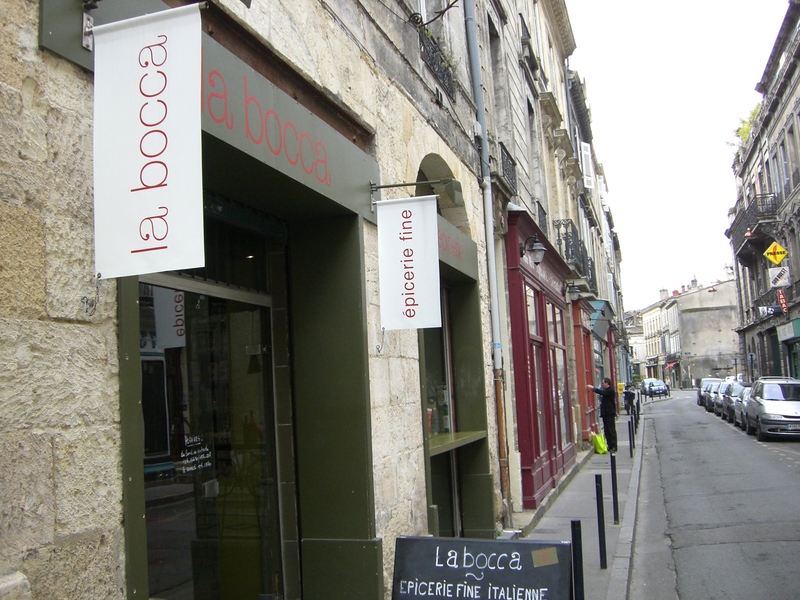 La Bocca was recommended to me and when I saw the line going out the door for its Takeaway Sandwiches, 5 Euro which included a drink, I thought that was a good sign. I ordered a marinated artichoke and “Copa” sandwich (fine italian sausage), both of which were generously heaped onto a whole half baguette. About 10 diners were enjoying their lunch on premises, which is about all this Epicerie Fine can accommodate. With the business school just around the corner from its rue Notre Dame location, it does a roaring takeaway business for lunch. I took my sandwich and softdrink and walked the block down to the riverfront where there was plenty of open space and seating to enjoy my deliciously seasoned sandwich with other brownbaggers on this particularly sunny Spring afternoon. 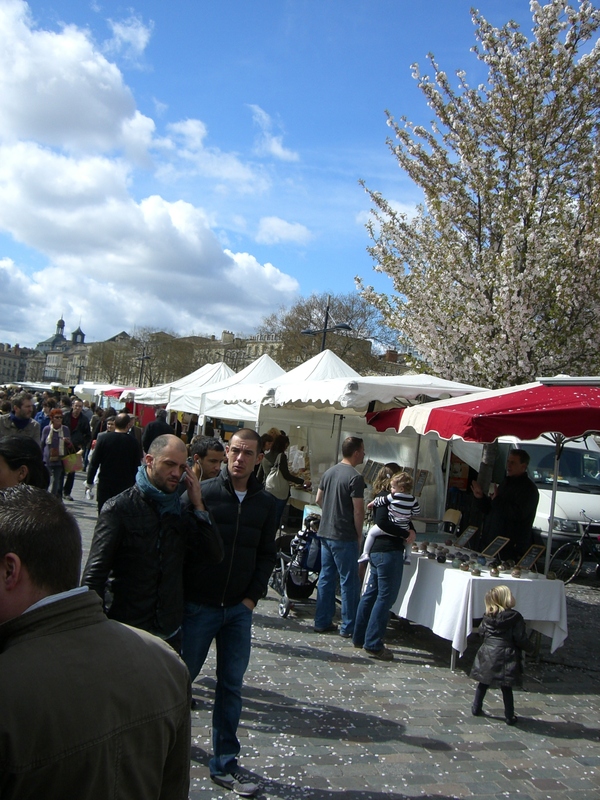 On Sundays, if you feel like getting some goodies from the fresh market, the Chartrons Market is closed, but just walk down to the riverfront where the Sunday Organic fresh market begins from Rue Raze and along the river for a good several hundred meters. 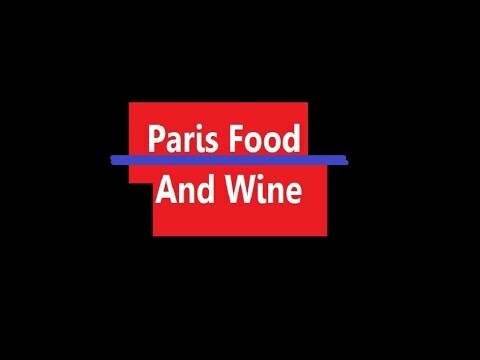 You will find the delightful French cheeses, pastries, roasted chicken and roasting pork, vegetables and crepes if you want a readymade hot lunch to eat on the spot. The other choice includes fresh oysters served with local Bordeaux white wine and crusty fresh, French bread. The Chartrons District has lots to offer and some of the fellow American travelers I met had the notion that it was outside the city! Back in the 16th c. it was outside the walled city but it has been a bustling local neighborhood of Bordeaux for several hundred years now. Other corners of Bordeaux city are equally as delightful and if you wander around the streets just past the Opera House you will find lots of beautiful little squares, most of which are lined with fabulous dining options. 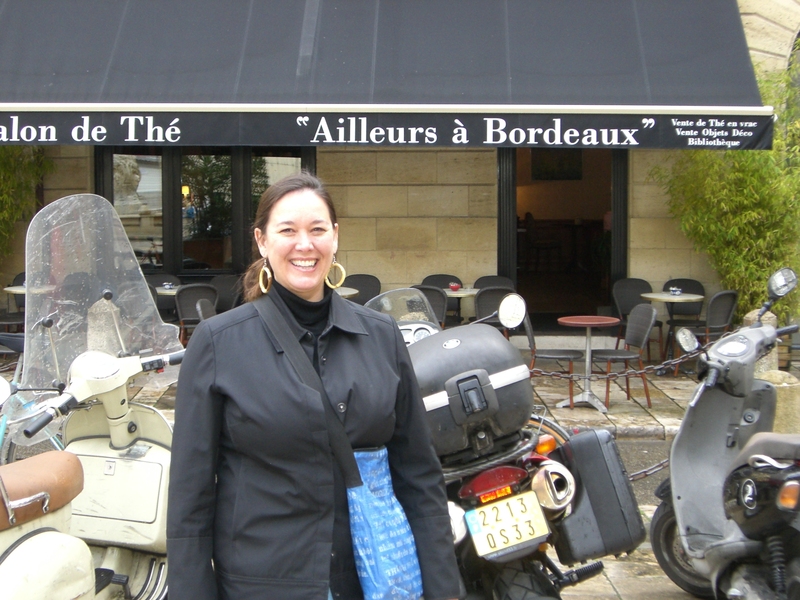 Just be sure to adjust your inner clock – after all, you are now in the South of France and you are in wine country.